Normally when a player signs an equipment deal, it relates to the clubs they'll be using for the foreseeable future and the company they signed with. However when Bubba Watson signed a deal earlier to wear Ping's latest range of gloves, it has an interesting story behind it. In addition to wearing the Ping Sensor Sport glove, Bubba Watson's Foundation will benefit from an annual donation made by Ping. The Ping Sensor Tour glove is the most premium of the three gloves, featuring a soft, lightweight cabretta leather construction with Ping's Sensor Cool technology in the wristband. RRP £18. The Ping Sensor Sport glove features the same construction as the Tour glove with addition lycra spandex integrated around the knuckles of the glove offering more flexibilty. RRP £16. The Ping Sensor Tech glove is made of a synthetic leather, rather than cabretta, and features more of the spandex material, stretching up through the fingers. RRP £12. Each of the three Ping Sensor gloves are available in more than 10 sizes, thankfully Ping sent us a few sizes to ensure we were trying the right glove for us. I tend to go between a medium and medium-large glove depending on the brand, and found that the medium-large fit me better in my fingers. Interestingly, each finger on all the new Sensor gloves is pre-curved to naturally fit your hand as your grip the club. 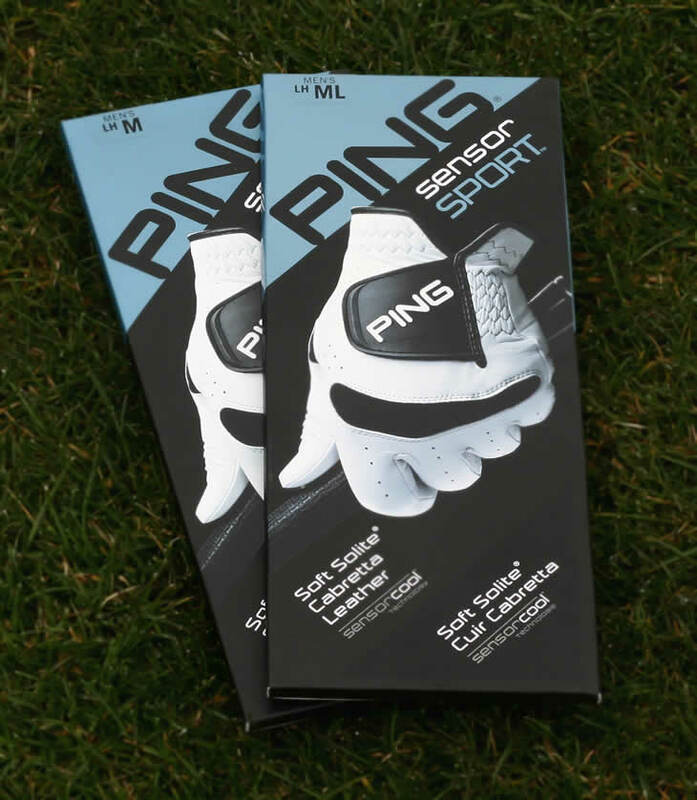 Ping say this, not only makes them more comfortable, but more durable as well. The Solite cabretta leather that Ping have used is extremely soft and premium. It certainly has that new glove smell and new glove feel on your hand. 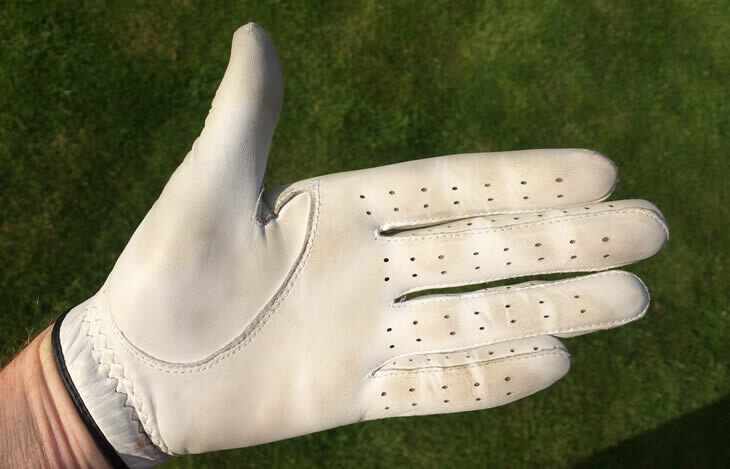 However, all-leather gloves can sometimes stretch or wear due to the different sizes and demands of golfers' hands. That is why Ping have added Lycra spandex to the Sensor Sport and Sensor Tech glove. This spandex materials sits across the knuckles on the back of your hand and makes the glove lighter and more flexible. Its not something I've looked for in a glove before, but I have to say it was nice. It can your fingers room to grip the club without the leather being forced to stretch or give. It is worth noting that the Spandex section is not part of the Sensor Tour glove, but is featured on the Sensor Sport (seen above) and Sensor Tech. Flip your hand over and the glove is very similar to most premium, leather gloves. It features small vents and aeration holes on both the front and back of each finger as well as in between them. Golf in Scotland doesn't tend to produce too much sweat. However, I do appreciate how important this is having played across Europe and the US in very hot conditions. Often your glove can be the first piece of equipment to suffer as it holds the sweat and dampens. Grip the club and the glove feels soft, tacky and smooth. When swinging, the material didn't stretch or slip, but kept a very stable grip whatever the pressure. Below is the palm of the Ping Sensor golf after I used it for around a dozen rounds, which is about the lifespan of a glove. As with any premium leather gloves, the palm did get a little bit discoloured through general use. Ping have added a Sensor Cool technology to the wristband, to wick away moisture and this additional breathability helped reduce the level of sweating and I felt it was better than most other gloves. The durability was also very good as I usually end up with wear marks around the base of the palm with leather gloves and as you can see there are no marks on the Ping Sensor glove. 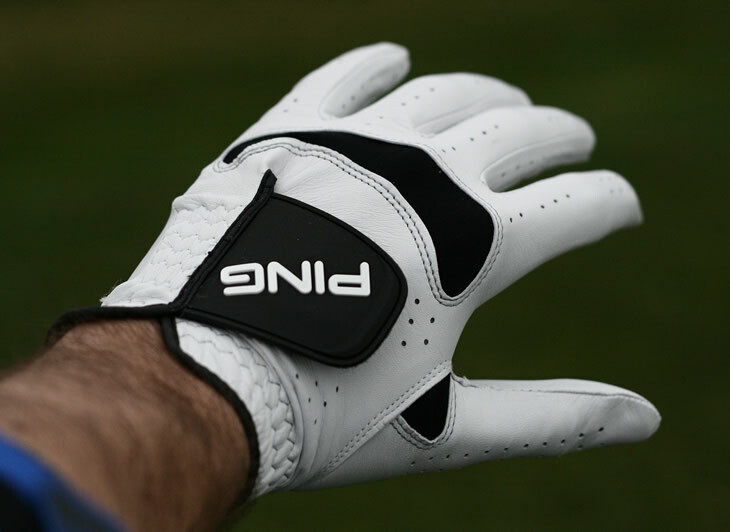 Overall the Ping Sensor glove combines the traditional feel of leather with more modern materials to provide a light, breathable premium golf that is well worth getting your hands in.